Join us for a Rockin’ fun night at Dan’s Place to celebrate our 5th Anniversary! Enjoy the great food, have a cold drink, take a chance on the 50/50 raffle, and rock the night away with two great bands! 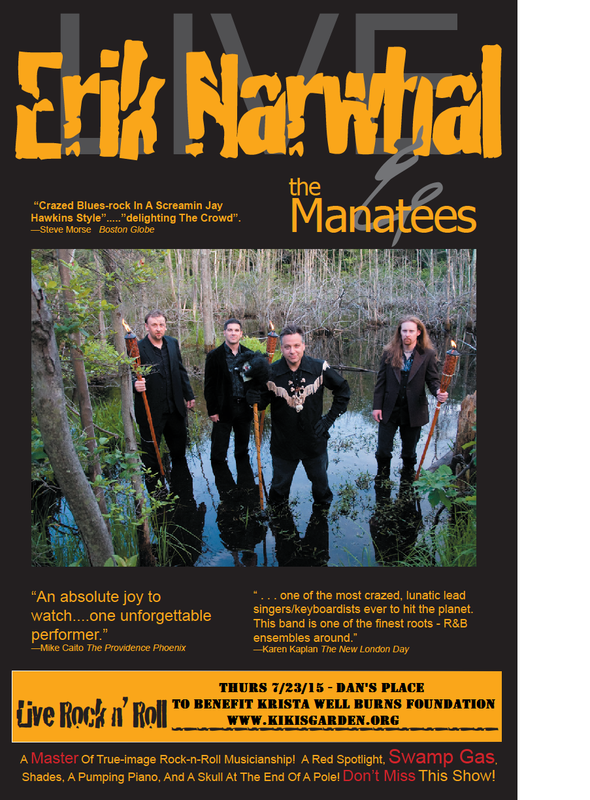 Rhode Island’s own Erik Narwhal & the Manatees will be kicking off the evening with their unique and wildly entertaining style of rock and roll. Great musicianship with and insane bandleader – no wonder these guys have a following!! AND…direct from Brooklyn…The Sometime Boys – a progressive roots band who’s musical styles range from their original work to traditional folk music to straight up rock and roll. Award winning vocalist, Sarah Mucho fronts a band of excellent musicians making this a night not to be missed. Dan’s Place will take 15% of each bill and donate it to Kiki’s Garden, The Krista Weller Burns Foundation. Thank you for supporting our mission to help kids Play, Learn, Create, Grow, and Bloom!